Writers spend the majority of their time inside their own world. Each word that makes it to the page of a first draft is a miracle, a survivor of a filtering process that viciously slaughters poor ideas. Even those words that make the page aren’t safe. They face a long distillation through editors that ensures only the finest make the cut as part of a finished book. To the reader, authors may seem like poets or magicians, masters of their domain. But they rarely see the carnage — the creative destruction — that is required to bring a great story to life. Because the creative process is a bloody business, for many writers even exposing a draft to someone else is almost an intimate act, an expression of trust. Letting another person — another writer — inside your world is an even bigger deal. It exposes your soul, your characters, and your finely crafted world to outside influence. Kyle Mills has stepped into the world of other authors not once, but twice. And none other than two of the biggest stars of the thriller genre — Robert Ludlam and Vince Flynn. 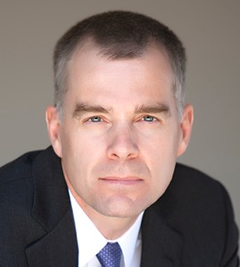 After a decade of writing thrillers published by HarperCollins, Putnam and St Martin’s, Mills penned the first of three novels he contributed to Ludlam’s Covert-One series. Kyle Mills, trail running in Chamonix, France, this year. 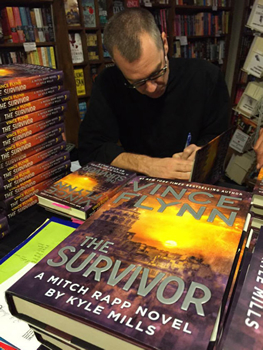 So intrigued, in fact, that the opportunity came up again later, when Mills picked up the torch for the iconic Mitch Rapp series following the untimely passing of Vince Flynn. Indeed, anyone following in the footsteps of a legend has a tough job ahead of them: Jane Seymour after Anne Boleyn, Lyndon Johnson after John F. Kennedy, Tim Cook after Steve Jobs. The expectations are justifiably huge. Sometimes it succeeds, sometimes it fails spectacularly. At all times, the stakes are high. So how do you make sure to get it right? 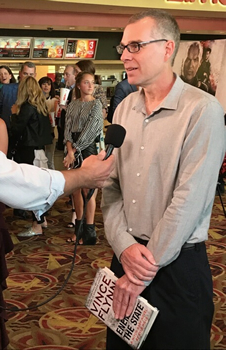 Mills being interviewed at the American Assassin premiere in 2017, courtesy David Brown, deputy director of publicity, Atria Books. Mills nailed it and the rest is history. 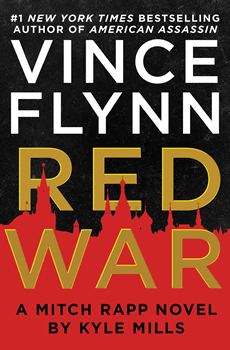 His new release — RED WAR — is the forth Mitch Rapp novel he’s added to the series. But he’s no mere stand-in. With glowing praise from Publisher’s Weekly, Booklist, the Associated Press and readers around the world — not to mention countless bestseller credits — Mills has done Flynn’s series justice and taken his own place among the giants. That last comment, and a growing pile of great books, show he’s no mere caretaker. The political thriller genre was largely built by stories of great power conflict between the Soviet Union and Russia, written by greats like Clancy and le Carre. But with the fall of the Soviet Union and the rise of Islamic terrorism, the genre largely moved on. Mills, signing ‘The Survivor,’ courtesy David Brown, deputy director of publicity, Atria Books. Now, it’s back. In RED WAR, Mills has harnessed the renewed interest in Russia’s global machinations to write a brave thriller that balances the best of old and new. Mills throws a much-loved character into a new situation, so Mitch Rapp faces a classic threat with a modern twist. In RED WAR, a critically ill Russian President sparks war with the West and takes out his own countrymen to cling to power. With the United States facing an opponent with nothing to lose, Rapp goes hunting one of the most powerful men in the world. 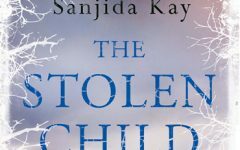 It’s a powerful novel that shows Mills is feeling at home in the series.